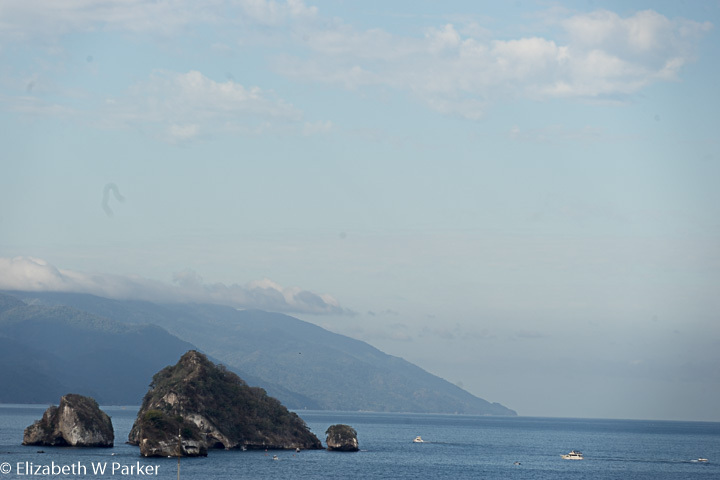 Los Arcos – a Puerto Vallarta landmark which we will explore by boat – next time we come! 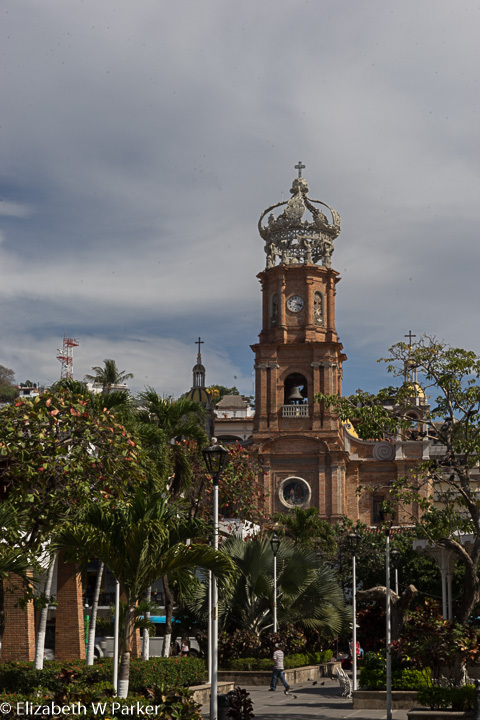 However, we countered all that negativity with a couple of hours at the Botanical Garden of Vallarta. The guidebooks say you need more than 3 hours for the gardens, but we thought that was an exaggeration. Even stopping to take pictures of the bounty of orchids and having lunch at the restaurant, we still had to stretch to make it a three-hour visit. Perhaps the 3 hours plus are necessary when you add the travel time to and from: The trip back to our hotel afterwards took over an hour. That said, it is worth a visit. The gardens have lovely walks among the plantings. It is clearly a work in progress so returning on a future trip is among our plans. There are so many orchids! There is also a section dedicated to succulents planted to create patterns. It is very artistic and very pleasing. The restaurant deserves its good reputation. The food was fresh and tasty and the service excellent. While we waited for a table on the balcony (the restaurant is on the second level) there are interesting displays of fauna and flora – like the curiosity cases of old collectors. There is also a whole section of books on the nature of Mexico, which you can take to your table and read during your meal, assuming you are there alone. They have been donated by garden patrons – intriguing idea, right? There are a couple of long trails, like mini-hikes, through the land that is not yet developed into gardens. We took one, but we couldn’t see the point of it. There are no plants identified along the way and the trails are poorly marked. One offers an option for swimming, but unless you brought your bathing suit… I think you can skip the trails. We took a cab back to the hotel, as I said, an hour’s drive. 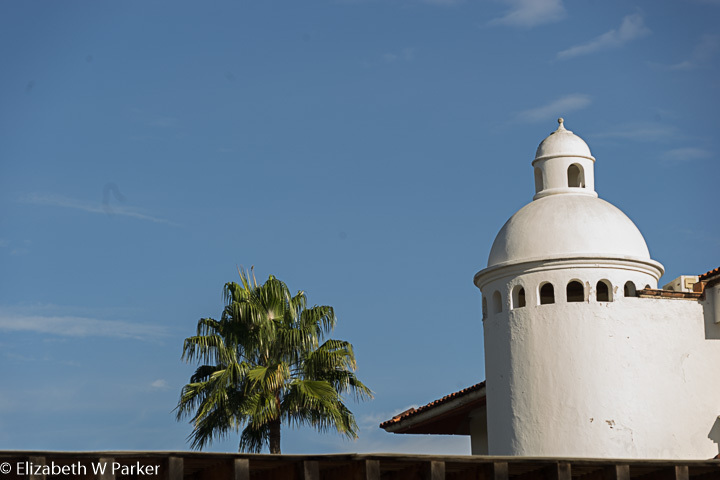 The garden is to the south of Puerto Vallarta – at Boca de Tomatlán, you head inland and drive through the foothills to finally arrive. Wednesday evening we had dinner at Tintoque, a newer restaurant in the Marina area, though not next to the water and the boats. It was a wonderful dinner. They took us without a reservation. The restaurant decor is brick, wood and metal – like old barns. The room cavernous, but with tables covered in good linens, the result was welcoming and warm. The service was excellent (very attentive yet not hovering) and the food was gorgeous to look at and muy sabrosa. This is Mexican food to the extent that the ingredients and influences are local, but the execution is artful and amazing. A cold salad of callo was served with thin slices of avocado, pear and chayote, arranged like flowers on Easter bonnet. (I apologize for the untranslated “callo” – I still haven’t found the English word for it but it is a mollusk…if you know, please tell me.) The portions were not large, but we shared two appetizers and two mains and went home quite satisfied. Today, was a real vacation day. We got up late and strolled over to the Marina to have breakfast there. We ate at a place called the Terrazza di Roma, in their section out over the water. Nice view. Good breakfast of enchiladas suisas for me. Back at the hotel, Gerry had two massages (a couples massage for just one of the couple – I don’t do massages) and I sat at the beach, finished my book, read a magazine, and did a crossword puzzle. And I got sunburned. Fortunately, neither badly nor painfully. Cleaned up, we went to “town” in the late afternoon to shop for gifts and souvenirs. We have a reservation for dinner at Café des Artistes. Shopping had us wandering through the crafts markets and flea markets, but I have developed an aversion to high pressure tactics since the time-share episode, so we didn’t see anything of interest (we were dodging the vendors to the extent that we saw nothing at all.) Finally, in the quiet market just beneath the Rio Cuale bridge I found a small handbag that I needed, since I did not bring one. That seemed to break the ice. I almost purchased, and may go back for, a table cloth made in Oaxaca. However, I saw that when I was looking for something I had seen a few days earlier and I was a woman on a mission. This sought item was a wall hanging made from tree bark. It was woven with straw in a large central medallion and then embossed with a design made much the same way as you emboss leather – a stamp that is struck with a hammer. I was very satisfied with my purchase and the vendor rolled it up in protective cardboard so that we can pack it to take home. Dinner at Café des Artistes was exactly as it should be given that this is billed as Puerto Vallarta’s best restaurant. Again, I was impressed by the service – professional, efficient, friendly – from the hostess to the waiters and the bellboys. The food was divine; Foie gras that melts in your mouth, lamb, duck – all delicious, succulent and wonderful. We even had high ball margaritas in keeping with the elegance of the surroundings. It would be hard for me to say whether I preferred Tintoque or Café des Artistes. Years ago we were introduced to the Bib Gourmand concept used by Michelin. Bib Gourmand is the designation given to new, up and coming restaurants that have the ability to be Michelin starred once they have a track record. At the time, we could only afford Bib Gourmands, but we were always very impressed with the food and the service. That is how I saw Tintoque… Café des Artistes would be an already starred restaurant – firmly ensconced in its greatness. 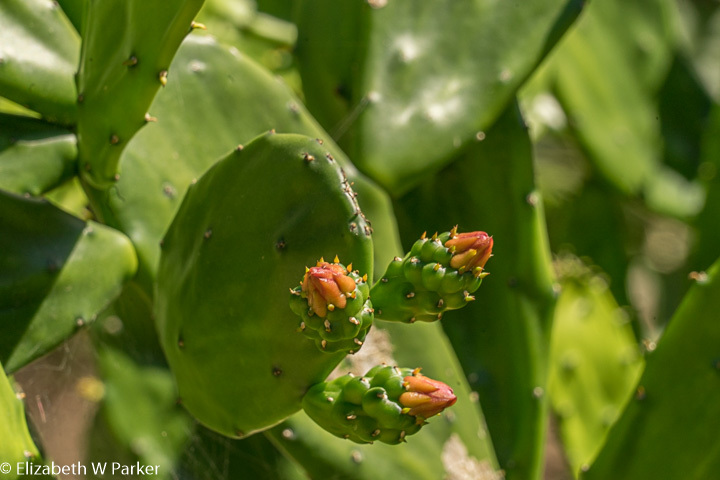 The beauty of Mexico – these are not the prices of France! But a big hearty lunch of French fries (with tajín) and hamburger with pickled jalapeños seemed to be just what I needed to put me mentally back into a patience mode, long enough to get the pages finished and the post ready to go! We took a long walk about 4:30. We went back to the Marina area with the intention of trying to find our way all the way around it. That was impossible…there are lots of private residences in the Marina area and the walkway ends, forcing you back to the commercialized area. 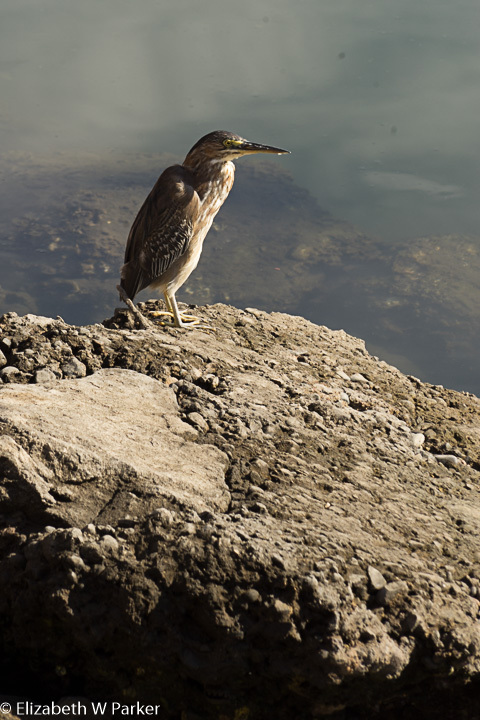 There is much to fascinate in the Marina. If you are into yachts, you’ll be in heaven. There are some mighty big boats. There was even a pair of boats – matching…I called them Mother and Baby Orca, Gerry thought of them as husband and wife since the smaller was not that much smaller! There are smaller boats too – just no wooden fishing boats. These fishing boats are flashy fiberglass and possibly 50 feet long at the small end of the range. Of endless fascination is the possibility of seeing a crocodile. Four of the five times we walked in the marina, we saw it (or one – I have no idea if there is more than one, all crocodiles look the same to me!) You always know where to go to see it…there will be a crowd of people at the edge aiming their cameras down to the water or pointing. 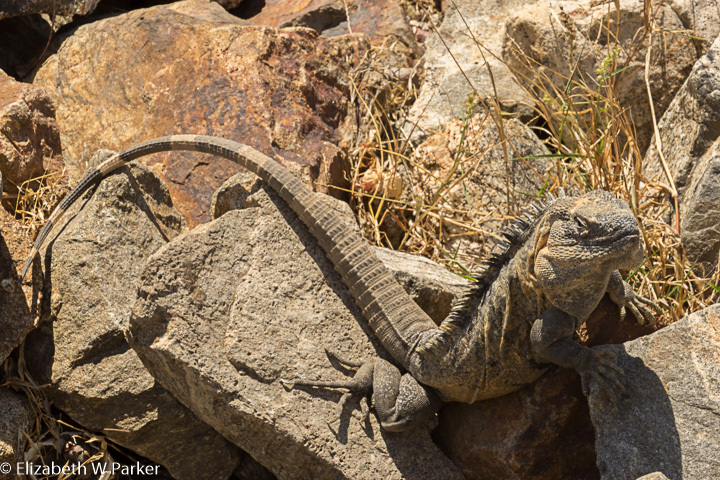 There are also iguanas, varying sizes – none huge. 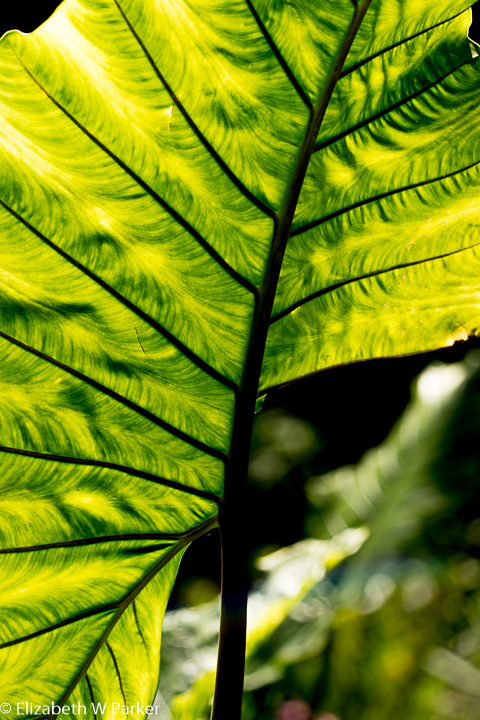 They are colorful, not just plain old green and black. They have gold and red scales, brown, green too and of course, the striped tales. They love to have their pictures taken. You can be snapping away at the croc, and then here’s this fellow right in front of you, bobbing his head up and down, as if to say “Hey! I’m here too! Take my picture!” I realized that most of the other tourists never see big lizards, but even though lizards are a staple in Puerto Rico, I still like them, too. 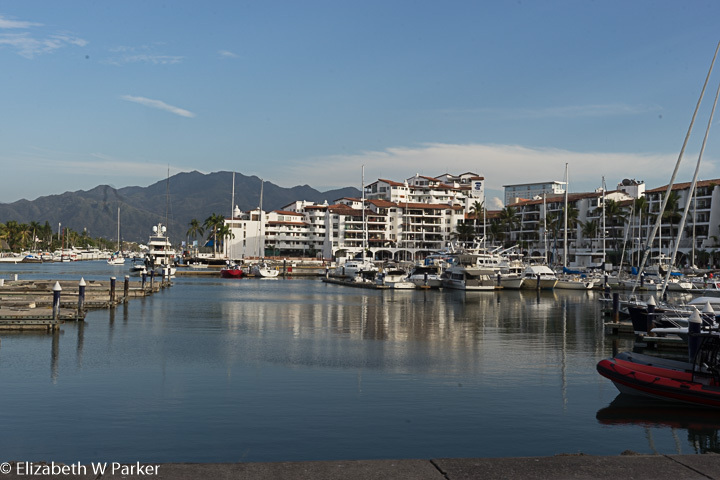 Marina Vallarta Crocodile – the boat at the top of the picture provides some scale. this one is easily 10 feet long. Friday night, we had a private dinner for two on the beach. I know, right? I have no idea why or how – like the couples massage, the dinner was offered to us in a letter we found in our room one day, along with a basket of roses and fresh fruit. We are thinking it might be because of our anniversary…but I didn’t want to ask. The mystery was part of the fun! 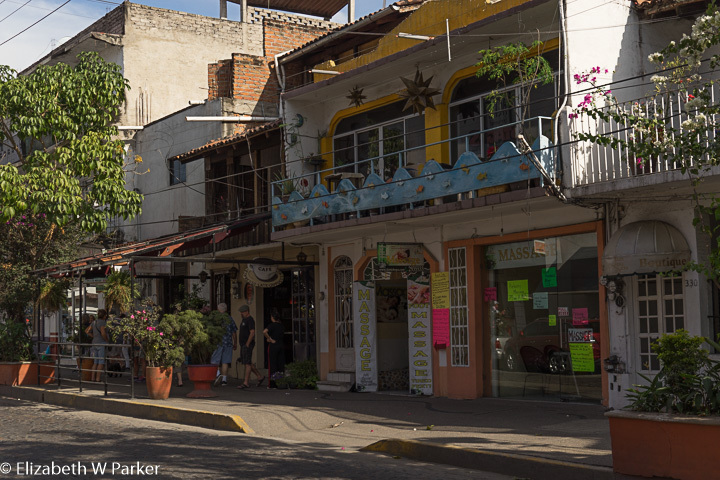 So, we sat at a private table under a little thatched roof, with our own dedicated waiter and had a quiet dinner looking out at the twinkling lights of Puerto Vallarta, at boats moving around the large bay. We even got to see 3 fireworks displays around the bay. A typical Friday night? Who knows, but it was special for us. Our last day! We were a little at loose ends. Having decided not to do the things we decided not to do, what should we do? Shopping in town in the afternoon would allow us to buy those things we still wanted to buy (tablecloth, T shirts) and we had a notion to eat at a highly recommended place in town. But the early part of the day stretched before us. Empty. Sitting on the beach or at the pool? Nah. Wait! Here’s something .. El Estero El Salado. (An estuary park with a boat ride in the mangroves.) OK!! The place is a state park project. 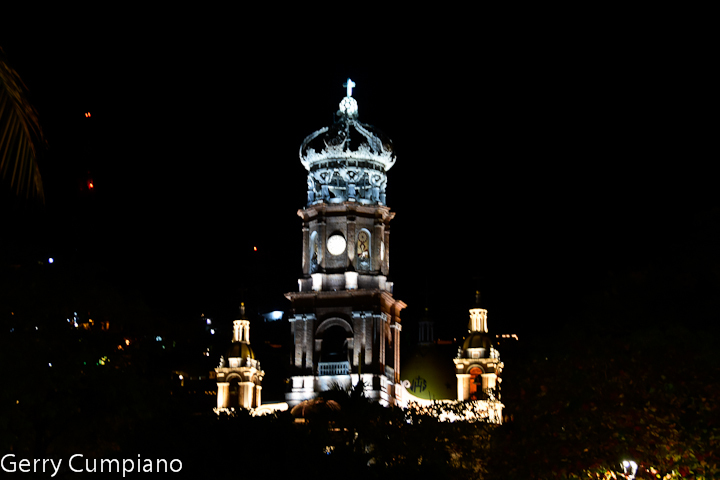 (This is Jalisco state.) The project involves the raising of crocodiles for re-introduction into the wild. Though a top predator, crocs are killed illegally by people who don’t like them and who are just afraid of them. 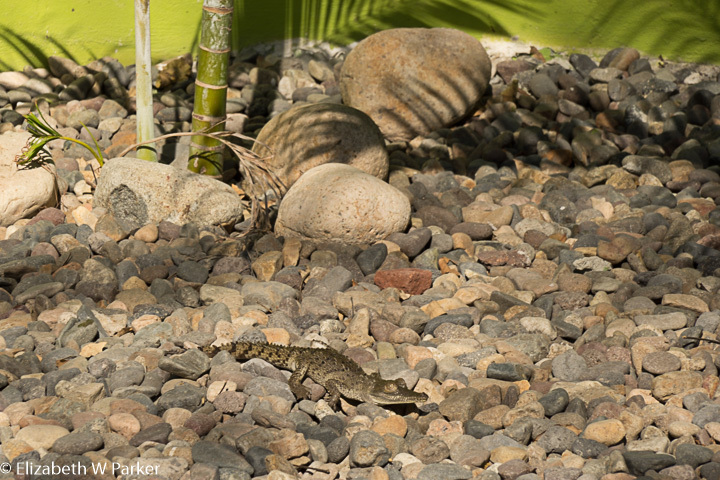 According to our guide, there are about 46 crocodiles in the park, but only 7 adults. 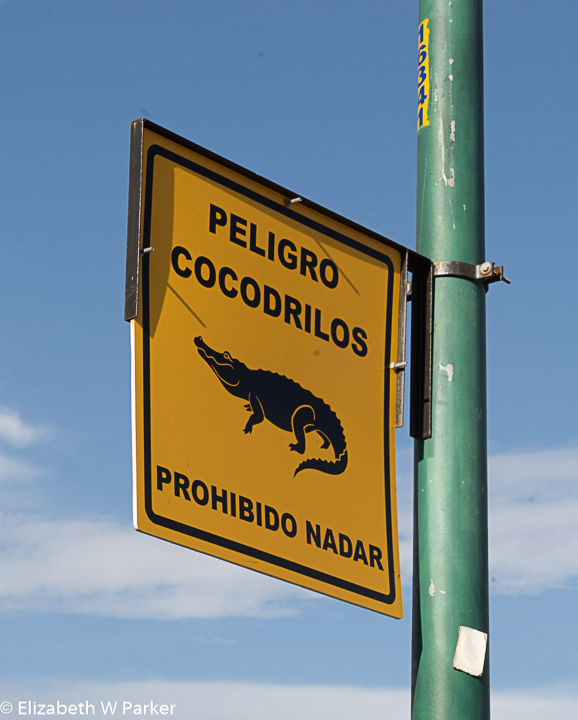 In the Banderas Bay area (where there are 3 other reserves) there are about 150 crocodiles – an endangered species. Besides illegal killing, the crocs suffer from reduced habitat because of all the condo and hotel development in the area. 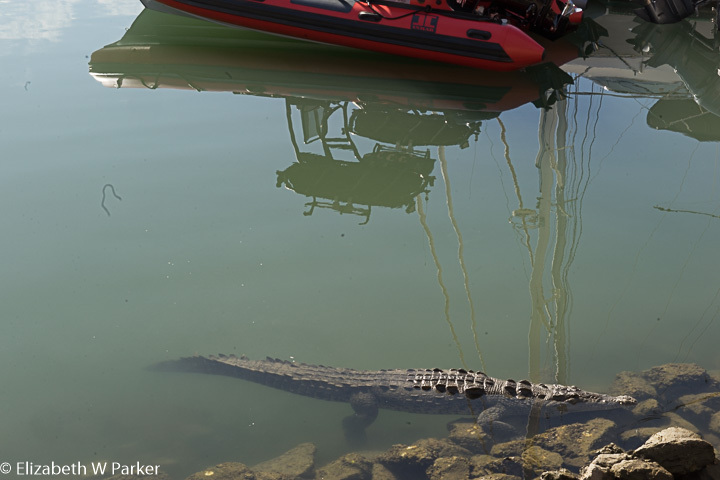 Crocodiles like brackish water, like estuaries, and rarely are found in salt water. The destruction of the mangroves has forced some crocodiles to adapt to salt water, but still most are found in the wetlands. The Salado Estuary is also a mangrove restoration area. Destroying mangroves is punishable by law, but like everywhere else, short term monetary gains outweigh long term ecological benefits, and the mangroves here are also endangered. The park is in its infancy, and grounds/structures are not at all polished, but the information is first rate. Our guide, a history major with a specialty in ecological sustainability and a biology hobby, may have struggled sometimes with her English, but she knew what she was talking about! She showed us a crocodile nest, and the pens where they raise the little crocs…they keep them here at this facility until they are at least 4 years old. They only grow about an inch a year, so even at 4 they are pretty small. Another interesting fact to know and tell – a crocodile’s gender cannot be determined until the animal is at least 5, and she told us, even then, the procedure for a biologist to find out is extremely painful for the animal. We also left the boat and climbed to the top of an observation tower, from where we could see the extent of the estuary and the park. From up high, we could also clearly see the different types of mangroves – distinct by color and height and nearness to the water. 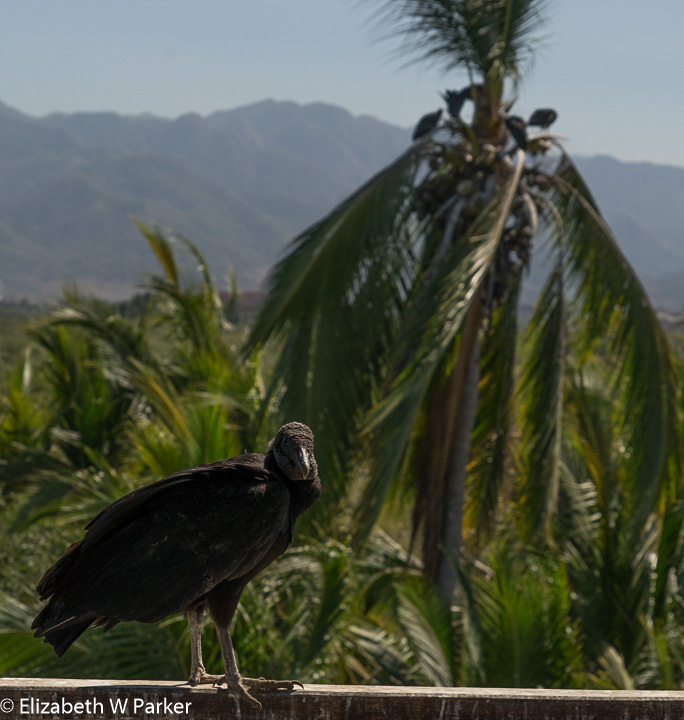 There was a vulture up on the tower, and he/she was unfazed by our presence and proved a perfect model for the photos. If you go, check the website first for the times of the trips. They are scheduled about 2 hours apart. The boat section takes about 90 minutes, and the land portion about 20 more. It was not inexpensive by Mexico standards. Tourists pay 300 pesos per person, about $17. (Residents only $100.) Talking with another taxi driver about it he was saying that even 100 pesos is too much for a Mexican family “just to see crocodiles” which is why I want to emphasize the educational aspects of the trip. 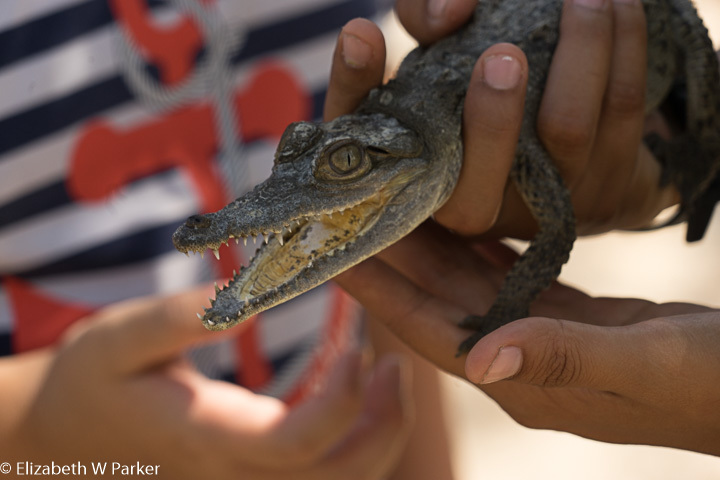 It isn’t just about seeing crocodiles – it is about learning about estuaries and their ecological role as well as their role as habitat for certain animals and organisms. (here’s another informative review of the project. After the tour, we walked back to the Marina and had lunch at Victor’s. The food was good but the portions so huge that we took ½ our food back to the hotel for Sunday’s breakfast! Just keep in mind if you go there, any of the combination plates is enough food for 2. A big lunch equals a big nap, of course, but by 5 pm we were headed into town. We have used both cabs and Uber to get around. Fares are reasonable, the cars nice enough, the drivers good and marginally helpful. Today, we got out at the beginning of the Malecón again, and walked to los Muertos Pier. It felt much shorter today than it had the first day, but it was just as colorful, and pleasant in the late afternoon. We did the little bit of shopping we wanted – I found my tablecloth (new dishes, don’t you know…) but Gerry was not able to find a T-shirt to his liking. 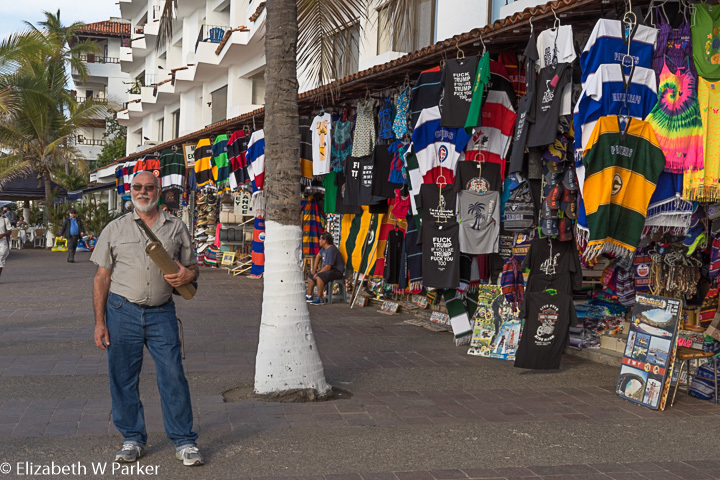 For sure, there are lots of t-shirts for sale, but nasty sentiments about the current US president, or quips about being on the “fun side of the wall” probably need too much explanation to be worn at home; there are also lots of tees with tequila and/or beer drinking themes – also not our style…There were also things that I kind of had to shake my head at – a Mexican poncho in the colors and with the logo of the Green Bay Packers? You could get one for any NFL team, but…really? Back in the plaza I think of as the main section of the Malecón there was a rock concert going on in the little amphitheater. The female singer danced as if she had read about how to do her moves in a manual – it was a little comic – especially since she was very primly dressed in heels, a straight A-line skirt and a blouse (like an office worker). We had our last dinner at Gaby’s, a well-recommended restaurant about 2 blocks from the cathedral. We sat on an outdoor patio on the second level above the street. To one side, steps cam up from the street and continued up the steep hill. We could see the bay and watch the sunset. We drank organic tequila, and got into a conversation with our waiter about raicilla (local homemade “tequila”). He and his family make it, and he gave us a sample that apparently is sold through the restaurant. His version was sweetened with honey and flavored with the dried fruit of the calabash tree, the same fruit used to make maracas. It was very good. Our ceviche was chopped into small pieces and served molded, not as whole pieces of marinated fish. We had beef fajitas as the main course. (We shared both, having overeaten at lunch!) There was a great flan for dessert. Tomorrow, Sunday, we will begin a long trip back to Wisconsin. Ready as we are to go “home”, this has been a better than expected trip and we are both a little sad to see it end. 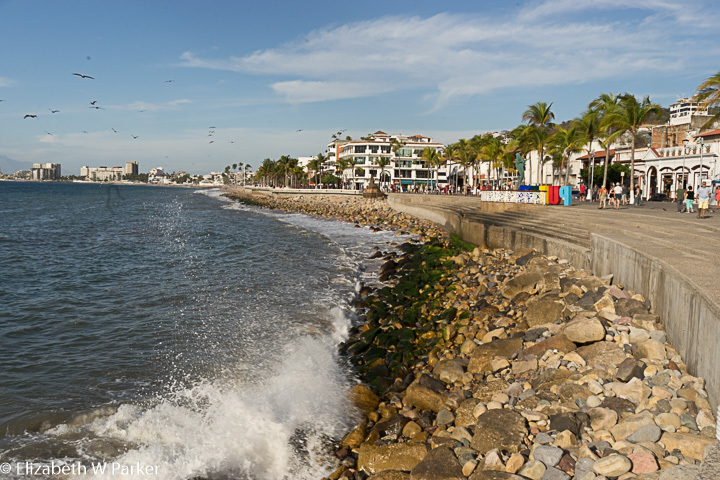 There are lots of good reasons to visit Puerto Vallarta. Though we didn’t know what those might be when we decided to come here, we discovered them slowly through the course of the week. 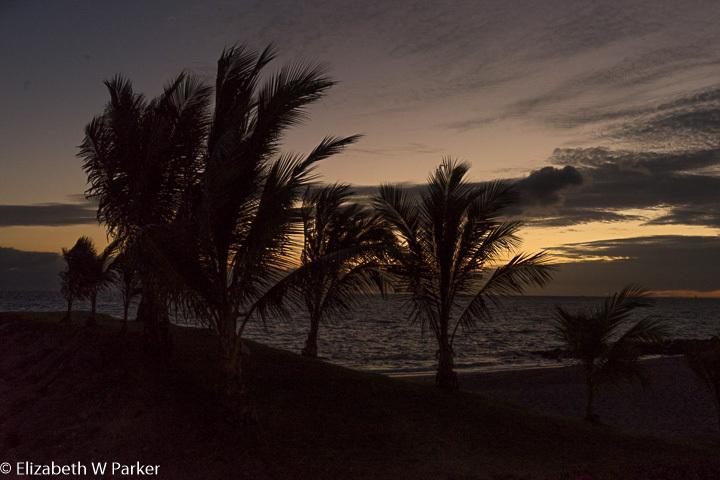 A great place to relax, to bring a family, to get away from the cold winter – these are going to predominate. But even for people like us, not really into a beach vacation, we found lots to do and could have done more. The food is great and the people are welcoming. If you come, you’ll have a great time. For sure, try to take a cooking class! 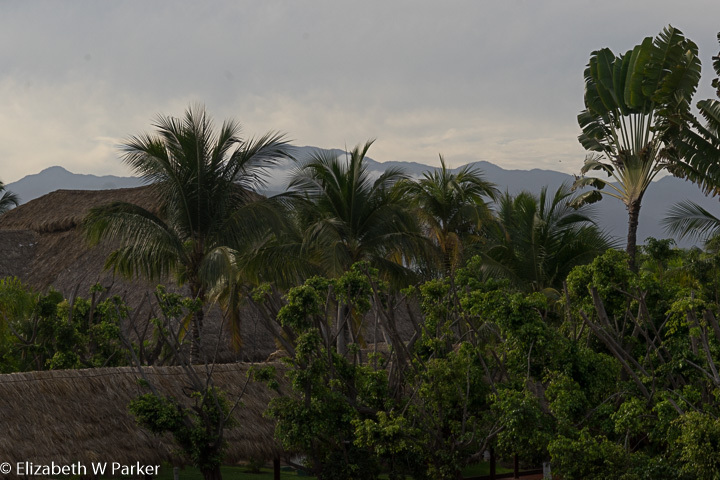 Final look at Puerto Vallarta a view of palms and mountains.